In honor of Earth Day, I am reposting a piece from last year that generated many emails and comments. It relates directly to our earth. Today's post is touching upon a subject relevant to both women and the environment. I am sure we will all have very different opinions on this subject. I for one am not sure where I stand, but after speaking with many women and listening to both sides, I am much more open-minded than I was before I started this piece. When I was in gym class in sixth grade, I got a most unwelcome visitor--my first period. I was mortified, disgusted, even a bit ashamed. Two years earlier, our elementary school nurse, Mrs. Whitcomb, had given us pamphlets with yellow and blue daisies called "Growing Up and Liking It" and had us watch a film strip in order to prepare us for what would happen some day past that point when we were 9. Even though I paid attention, I was utterly unprepared for this event. I remember going to the school nurse and being so embarrassed to tell her that I needed "a maxi pad" in my quietest voice with my head pointed down looking at my feet. She gave me some large and heavy contraption from her drawer that had a safety pin attached to clip to my underwear. That box of items in her desk had probably been there since the early 70s. It was horrible. It felt like a diaper and I thought everyone would be able to see it through my jeans. When I got home, I burst into tears and didn't want to tell my mom about this new phase of my life. What an emotional time the preteen years can be. I am sure you can all relate one way or another. I knew what my options were: pads or tampons. That is all I knew. I knew which brands were OK, which weren't, and I've just learned to deal with it for more than 20 years, and more to come. What has changed, however, is the fact that there have been green companies cropping up in growing numbers to offer women a healthier, more ecofriendly alternative to traditional feminine hygiene products. On Etsy alone, if you type in "feminine hygiene pads" in the site search, you will get around 500 different options. There are options outside of Etsy on major websites such as Drugstore.com, which carries the brand called Lunapads. This line gets rave reviews by users who've submitted reviews to the website. Lunapads is probably the largest and most well-known of the brands offering cloth pads. This is a woman-owned business with 6 employees. Their website is also full of imformation about why you may want to consider switching. Lunapads also sells The Diva Cup, which is tremendously popular among green women. This would be your alternative if you prefer tampons. This product gets raves on parenting/motherhood message boards, holistic health circles, and even on the message boards on the Lush forum. So why would one want to switch? "I am all for saving the earth and lowering the amount of crap I use in things, but not this. I couldn't do it." "The thought that I have to wash them... ack." "I would always be terrified they wouldn't absorb enough." "That is the most disgusting thought to have to deal with those...the mess, the smell..yuck! Love the patterns, hate the concept! I picture hippy women wearing these." "I could never do it." "I am all for saving the earth, and I definitely do my part to recycle and conserve energy, but this is just one thing that I don't think I could get used to." Over 18 billion disposable diapers are in landfills in North America each year. That number is staggering. If I had a baby in diapers now, I actually would most likely use cloth. So my feelings on that have actually been changed. I used to use paper plates unless we were having company because I was too lazy to spend a few extra minutes at night. We haven't used paper plates, cups or napkins in a long time. They were convenient, but we have been transitioning to being greener over the past couple years. It is estimated that over 14 billion tampons, applicators, and pads sit in landfills in North America each year. Would I be willing to change my opinion on this subject rather than dismissing it as gross? I had the pleasure of speaking with Erin, the woman behind a growing Etsy business. 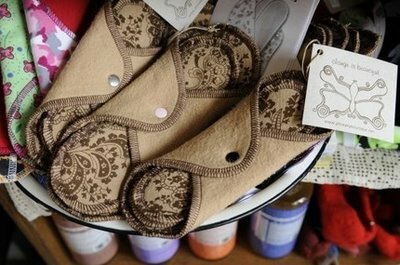 She makes cloth pads and pantyliners and offers a nice selection of handmade, organic cotton items. Her website offers an even larger selection of items, including women's clothing. Erin answered many questions as to WHY a woman would want to make this switch. Chemical Avoidance/Health Impact--The manufacturing process is tough when it comes to this industry. The procss of producing disposable pads and tampons involves the use of chemicals such as additives, bactericides, fungicides, absorbency gels, glues, fibers, and other chemicals which remain in the pads and tampons. We put some of these chemicals into our bodies when we use tampons. We are repeatedly exposed to these for days at a time for decades when we use pads. Most tampons and pads are made and bleached withorganochlorine, which contains dioxin. You've heard me speak of this chemical before--the Environmental Protection Agency (EPA) calls this the most dangerous carcinogen science has seen. The health impact must continue to be explored. When I was speaking with Erin, she told me of another positive impact the switch has made--her periods are lighter and shorter. This is a common rave from women I spoke to who use cloth pads. Researchers are studying links between the chemicals in feminine products and the effect on a woman's menstrual cycle. Eliminates the potential risk of Toxic Shock Syndrome--The risk of this very rare, but deadly disease, is eliminated. I know it is extremely rare, but I do clearly recall the human resources manager at my local Kaufmann's dying of TSS in her 40s when I was working for Lancome. She was in her 40s with young children. This was 9 years ago. Environmental Impact: Disposable pads are made from chemically treated wood pulp. Not only are the pads themselves made from non-biodegradableable products, the packaging itself (outer wrapper, individual wrapper, plastic strip) is also add to landfill. Even when cloth pads wear out because they are made from natural materials, they can be composted. Economics: Women spend, on average, $10 a month on disposable pads and tampons. This adds up to about $120 a year. When you consider the number of years you need to buy these items, that is thousands of dollars. For the cost of a few months disposable pads, you will have enough to last years with the potential saving of thousands over a lifetime. Most of the cloth pad companies I have checked out offer separate liners for their pads. The pad itself has a liner attached to it. You take out the cloth liner, soak it in warm water and wring it out and then toss in your washing machine. Many people I have spoken with say that it's best to line dry the liners for longevity, but that the rest easily goes into the dryer. I also spoke with a lovely woman who has used some of hers for nearly 10 years. The main concern I found from the women I spoke to on this issue was a concern that this is something dirty, messy, and unclean. No one questioned the environmental impact. I have said myself that I thought this concept was gross. The idea that I would wash cloth pads, frankly, is off-putting to me. My thoughts whenever people brought this up were always the same: Yuck! Will my opinion change? "I have a Diva Cup. This is a silicone alternative to a tampon. It doesn't absorb the blood, it collects it. I think it is safer for my health in the long run." "I have been buying cloth feminine napkins for 2 years. They make me feel more comfortable and in control as a woman, almost empowered. I used cloth diapers on my children because I was concerned about the Earth. It made sense to me that if I used cloth on my children for 2 years because of the Earth, that I should do the same since I will wear napkins for about 25 more years." "I order cotton pads from a lady on Etsy. It was strange at first and is now routine. It really is no big deal and I don't have to worry about sticky pads, the bulk, and how they make me feel as if I am wearing a diaper." "Don't knock it until you've tried it. Honestly, once you try these you will never buy Kotex again." Once I have an opinion, it is hard to change it. I am very strong-willed that way. Even with me, logic can sometimes take over. We have gone greener and more natural with the hair care we use, the bath and body products we use, household products, lightbulbs, etc. My kids have known their three R's--reduce, reuse and recycle--since they were old enough to learn them. I am extremely careful about what goes into our bodies--from the foods we eat to the ingredients in our toothpaste and my mascara. Knowing how many chemicals are in disposable pads (Seventh Generation offers chlorine free disposables), logic tells me to stop being close-minded on this subject. The quote from one of the women I spoke with could easily have been said directly to me: I haven't tried them, but I've been knocking them. I believe in living as green as possible. I believe in avoiding chemicals which have been shown to be harmful. Why, then, have I been so resistant to change on this one issue? After speaking with so many women who use disposable alternatives, as well as talking to Erin from Etsy's Phreaky Boutique (she also has a website), my feeling has changed enough to be willing to try this cloth alternative. I'd like to thank the women who spoke so candidly with me and shared their opinions and experiences. I also would like to thank the lovely C & G reader who emailed me and asked me to talk about this subject. FLASH FORWARD: It is now more than a year since I published this piece. After writing it, how did my feelings change? They did in a major way. I have been buying only cloth for nearly a year now. There really is nothing dirty or disgusting about it--I have saved lots of money and am helping the earth at the same time. I also noticed that the products I ultimately liked the most were from Phreaky Boutique, bit it looks as though she isn't making many right now. If you do a search on Etsy, 1000 Markets, or other venues, you'll find others for sure.